Click here for information on where to buy your Cub Scout Uniform and Manual. Friday, September 22nd, 7PM at Holy Spirit Church. Plus an elective and, with your parent or guardian, complete the exercises in the pamphlet How to Protect Your Children From Child Abuse: A Parent’s Guide, and earn the Cyber Chip award for your age. Interested in joining Cub Scouts this Fall? Boys are welcome to join anytime, and Fall is the easiest time of all. Please contact us and join us at a den or pack meeting to learn more. Welcome Pack 11 Bear Den to the 2017-2018 Scouting season ! We are very excited to be your Den Leaders, and are looking forward to a fun year together. Together we want to have our boys have the best year ever, having fun and learning new things, like earning our whittlin’ chip, going over bicycle safety rules or the road, and earning our wildlife conservation award. 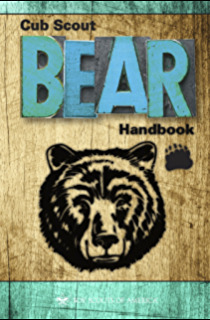 Our Bear Den meetings will be held once a month on Friday night at the Holy Spirit Church, plus an additional meeting to go on a hike, bike ride or other fun activity..
To get started, each Bear Scout needs to have the Bear Cub Handbook, which explains EVERYTHING about the Bear Cub Scout program. The handbook should be brought to each meeting. The uniform (not required for our den meetings). Bears do NOT need the uniform pants. Our cubs usually wear jeans or shorts with the cub scout belt. The upper uniform, cap, and insignia are all you need; you will need the patches for the “Connecticut Yankee Council” and “Pack 11”. We will answer any questions at the meeting. However do not hesitate to email us beforehand. The first thing we will work on as a Bear Den is earning the Bobcat Badge for our new scouts. This must be done before we work on the Bear rank badge requirements – but it’s really easy to earn this first badge. Here is a link to a general outline of the Bobcat Badge Requirements. It is VERY important in Scouting that the Parents and/or Adult Partners assist with the planning and running of an event. All of the leaders are volunteers, and we count on the Parents and/or Adult Partners to help us out. A Parent and/or Adult Partner are always required to be present with the Bear Scout at each meeting and/or event. I will post den-specific information in this area of the web site. Check the main page for a view of all pack wide events.